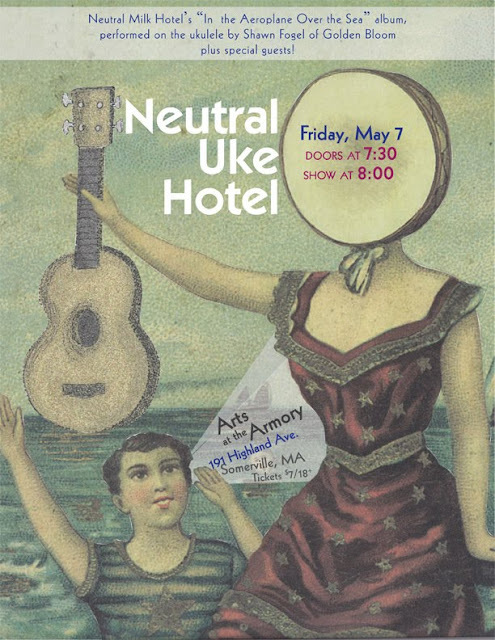 Always better than getting nuked, Neutral Milk Hotel will get uked when Golden Bloom’s Shawn Fogel takes his show on the road with his latest project, Neutral Uke Hotel. It’s exactly what you think it is, Neutral Milk Hotel music played entirely on the ukulele. To be more precise, Fogel has arranged Neutral Milk Hotel’s 1998 iconic indie album In The Aeroplane Over the Sea into a collection of classic contemporary indie pop songs that he plays on ukulele. This interesting idea came after Fogel worked with producer Roger Greenawalt's "Beatles Complete on Ukulele" project. Fogel explains, “After recording a version of the Beatles’ B-side ‘I'll Get You’ with Roger at his Shabby Road Studios, I performed with Golden Bloom, Guster's Ryan Miller, The Zambonis and Leah Siegel at the 2nd Annual Beatles Complete on Ukulele Festival held at Brooklyn Bowl this past December,” says Fogel. In March Fogel went to SXSW in Austin to play The Beatles Complete on Ukulele Festival alongside other artists including Ben Kweller. While additional shows are being confirmed for this summer, Boston fans can get a sneak peak when Fogel plays these nuggets on Friday, May 7 at the Arts at the Armory in Somerville.